Games Like L.A. Noire: Crime Detective Games '+g+"
L.A. Noire is an action-adventure detective game developed by Team Bondi and published by Rockstar Games for PC, PlayStation 3 and Xbox 360 in the year 2011. 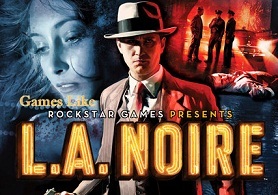 The game is set in late 1940s where the player controls Cole Phelps an Los Angeles Police Department (LAPD) officer as he rises through the ranks by solving cases and arresting criminals across five departments. If you are a fan of crime, noir and mystery games like L.A. Noire and looking for more games with similar gameplay then find the recommendations for it below and don't forget to mention if we miss any games as we keep on updating this list. Heavy Rain is an film noir thriller game developed by Quantic Dream and published by Sony Entertainment exclusive exclusively for the PlayStation 3. The player controls four main characters to investigate the mistery of serial killer who murders children and leaves an origami crane in their palm. The game has a number of different endings which changes with the player's decisions and actions during the game. Condemned is an first-person psychological horror game series developed by Monolith Productions and published by Sega. The player takes on the role of federal agent Ethan Thomas searches for the one who framed him for murder while surviving violent psychotic people who will attack the player on sight. Blade Runner is an point and click adventure game released in 1997 by Virgin Interactive Entertainment. The player takes control of Ray McCoy an young, rookie Blade Runner. The game play focuses mainly on searching for evidence and tracking down suspects. Broken Sword is an adventure game series released in 1996 by Revolution Software. The series revolves around the adventures of George Stobbart, an American patent lawyer and Nico Collard, a French freelance journalist in several fictitious stories based on history and mythology. Urban Chaos,....if you can think of more, then don't forget to mention it in comments.